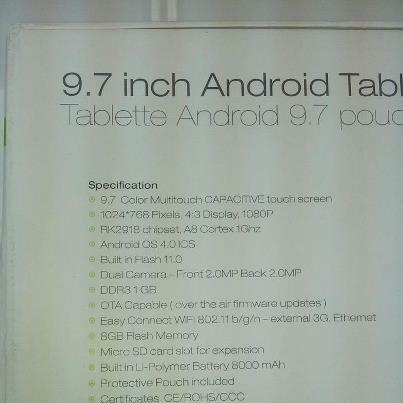 Nowadays in a market, Chinese made Android Tablets are easily available, with various names and specifications, it is bit confusing to judge because same specification and price is less compared to other ones, creates a doubt. Today I reviewed this Empire Tablet 9.7 Inches slim and display was too good as compared to many other in the market. HD supportive, but this one has 2 mega pixel camera rear and in front. It’s 1Ghz A8 Cortex , DDR 3 , 1 GB Ram with 8 GB space, 1 GB for apps, runing on ICS 4.0.3 upgradable. I used it for a while and check playback video quality which was stunning. Battery Duration is 3 hrs 30 mins on full usage, this is highest I have seen in chinese tablets, they are improving quality, Empire 9.7 is coming from UAE you can compare this NOVO Flame. So far when it comes to Tablet this one makes sense because of RAM , Processor and Display Quality rest I shouldn’t compare these tablets with Ipad or Samsung Note because they are not just branded but keeping the standard as well. If you want for Internet normal usage than you can get this and it would work fine the price is 19500/- where as others like this are less in price It’s slim something good obviously cost a bit higher. I was little surprised to see 2 MP camera since china is very good at fooling people, the result was satisfactory compared to 2MP. If you go in a market you will get confused because even the 3D Tablets are available now but It would be better if you want to keep for a longer duration to buy branded as Samsung or Ipad. Else this one I have personally reviewed, I would recommend to those who wants to use for Internet purpose and those who think the price is high ( china made ) than see the specification, GPS was not mentioned nor I saw in the options but it is upgradable. Qmobile Pakistan or Vietnam ??? Here’s a link ( QMOBILE VIETNAM , I went through entire website with translation what I found is that, all the mobile are Same Exactly like Pakistani Qmobile ! which one is the original out of both ” Qmobile Pakistan or Qmobile Vietnam ” this is little complicated since Q mobile imports all the units / sets and TAG them , already exposed Micromax and Qmobile are exactly the same alike phones now this is another one for all you to understand more about this. I am not against nor I am in favor it is just that I like to share with you all, so here it is, Rest let me know by your comments and Join me up on facebook Sharing is Caring Page, that’s where interaction goes on between each other. So many efforts are being made to sort out the issues and poverty but than again I don’t understand rich is getting richer and poor one’s are dying as worthless creatures, compared to the world we live in now, I consider 50s and 60s era was lot better when most of the nations were healing their scars after World War II, 90s Era been confusing specially because of Gulf War I and last 10 to 12 years been worst in the entire warfare, eventually what exactly is the target, PEACE? on the barrel of the loaded gun? unity by riots and chaos? we don’t need to dig into our faith and belief to understand the simple things. for how long will we continue hatred and ignorance in the name of religion, race and piece of earth we belong too, is it really that difficult do we really need super man and bat man characters. the message of peace is in every religion stated same and even those who don’t believe at all are not in favour of slaughters. To me it seems as if United States has taken the responsibility of peace by violating each and everyone’s home town, which Constitution gives permission to openly terrorize people, This War on Terror since last 10 years, still not coming closer to final phrase continuing on, NATO forces and allies on the Afghanistan’s soil seems like fighting with invisible enemy Drone Attacks in South and North Waziristan (Tribal Area of Pakistan ) next to Afghanistan is being bombed least 2 twice a week, many innocent local civilians are dying and no one can verify were they really militants or innocents, Official figure by Pakistan is approximately 40,000 innocent people have lost their lives in just Tribal are. Is it fair way to deal with terrorism, frankly speaking it’s giving more spark even to those who aren’t terrorist but after being victim and losing their loved ones they must be joining Militants, for the revenge since Tribe people believe in Murder for Murder, no mercy for this. Remotely Controlled Drones from 8,000 Miles away CIA head quarter, relaying on the local sources Waziris by offering them handsome money (Dollars) for placing GPS where to strike it is a sensible way of any Intelligence agency to fight against terrorism I don’t think so. United States been extending its time of existence in Afghanistan, all thou their official figure of Talibans is not more than 50,000 but 100,000 troops are deployed and there is no difference in Game Counter Strike and the reality, daily many young soldiers die and get injured, what’s the out come, time after time United States been changing policies coming up latest trick and failing like last one. Having state of the art modern weapons yet fails to wipe off terrorists and when they fail, they directly blame Pakistan for supporting them. Indeed i am not saying Pakistan’s intelligence agency washed with holy water, Pakistan also needs to see long term policy with Afghanistan and knowing that 50% of the country is under Taliban control Haqani group is the strongest challenge for United States and not sure but Inter Service Intelligence must be having contact with them. “Obama mentioned Safe Heaven for terrorist ” directly he pointed to Pakistan that, Pakistan’s government or ISI agency is involved, meanwhile United State for no reason striked on Pakistani Check post on the border ” Salala ” killed Pakistani soldiers in november 2011, after which Pakistan stopped Nato Supplies from its ground routes, which still hasn’t opened but now United States is willing to apologize for killing Pakistani soldiers, let’s see when they do that. Relations between Pakistan and United States never been fair and equal accordingly, this time US shows frustration and giving strange statements to Pakistan, which might cause more intense damage or eventually end the relations since, Pakistan has strengthen it’s relation with Iran , Russia and China meanwhile United States, made it’s strong relation with India, for the peace in region Pakistan , Iran and China together can do alot more than what United States and India can think of, hence change in geo-politics shows frustration as well as anger. Pakistan has good relations with Afghanistan and Afghanistan knows well that, it has to maintain relation with Pakistan , Iran , China and India where as United States will fly away won’t be here for next century, since it is not their home land. neighbors have cleared their doubts and understood the need of each other more than they need United States but India is following footsteps of United States in Arms Race. United States don’t have good relations with Iran nor China, which is a downfall for US to exist here in long terms, this is the longest war in the history of United States and like before they have failed but to cover their shame they are continuing attacks, eventually they have to do table talks with Talibans because by now US ARMY has learn’t Talibans stand undefeated, wondering when they don’t have such modern technology weapons aircrafts, drones, etc. still they are able to fight with the country which claim itself as “the superpower” country of the world. strange. nevertheless, victims are people all around the world as well as Pakistani’s every now and than there’s suicide blast in some major city of Pakistan which is because NOT TO BE FRIENDLY WITH UNITED STATES ARMY. Citizens are sick & tired including me seeing all this since last 10 years and don’t know for how long it’ll continue. height of scariness is 3 huge big walls surrounding embassy in Karachi, petrolling outside and when something happens, People of Karachi get disturbed just because entire road gets blocked for the safety issues. God If you guys are so scared than why the hell are you in Karachi be in Islamabad, why becoming the disturbance of civilians in karachi. There is nothing good nor new about United States politics , Bush or Obama, just the change of face, the mask they wear is one, Obama has failed to deliver what he promised to his people, nor he been able to end the war but seems like Americans are also victims just like we are here in Pakistan, due to WAR ON TERROR.